The Highlanders have been struggling this season. They lost four games, drew one game and won only two games heading into this fixture. On the other hand, the Crusaders were on a high. They sit on top of the NZ conference and the overall standings with only one loss so far this season. 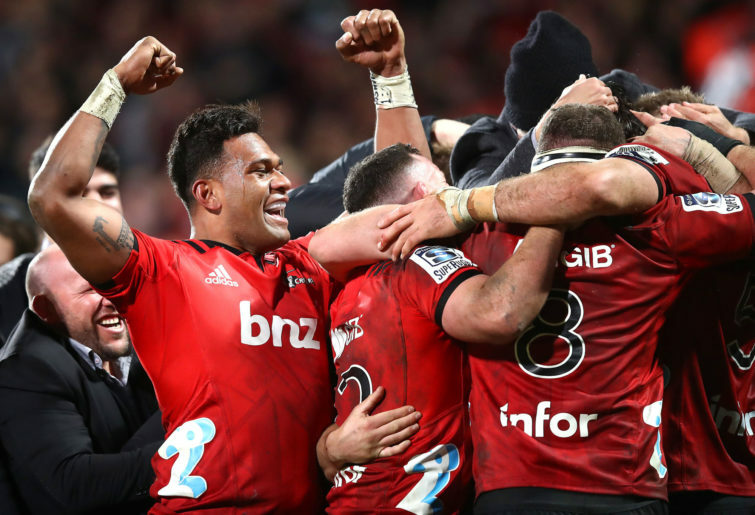 The last three meetings between these two Kiwi sides resulted in one win for the Highlanders and two wins for the Crusaders, and the Canterbury franchise were favourites heading into the Southern Derby. 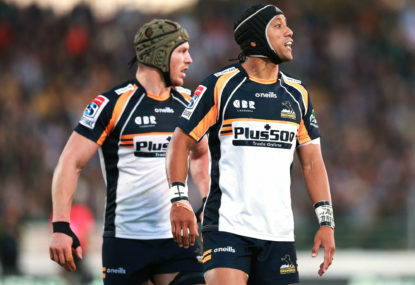 The Highlanders got off to a great start as the milestone man Ben Smith scored the first try of the game with a classy step to beat rival fullback David Havili in the third minute of the game. Josh Ioane converted the try. The Crusaders were rusty for the first 20 minutes with a couple of loose passes and handling errors. The early rustiness resulted in two penalties in two minutes – one for angling the scrum and another for being offside. 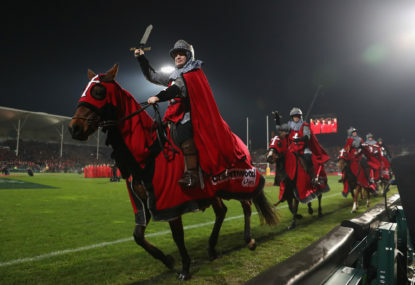 The Highlanders took the lead out to 10-0 through an Ioane penalty in the 11th minute, punishing the Crusaders for their five handling errors within the first 20 minutes. Impressive winger Braydon Ennor scored the first try of the game for the Crusaders. 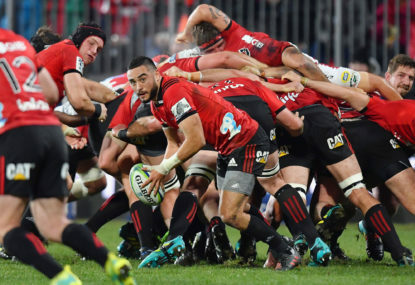 Richie Mo’unga made a clean break, beat two defenders and drew in two more, creating space for the offload to Ryan Crotty, who made a run and assisted Ennor for the Crusaders’ opening try in the 26th minute. Mo’unga successfully converted the try. The first half was intense and entertaining. The Highlanders led at the break 10-7. The Highlanders did look the better of the two sides in the first half, but the second half was a totally different story altogether for the men from Dunedin. Havili struck for the Crusaders in the 42nd minute, crossing the try line on the back of a strong run from All Blacks centre Jack Goodhue. Mo’unga converted the try to give the Crusaders the lead for the first time in the game. From there, the Crusaders never surrendered the lead. A 48th minute penalty to Mo’unga took the Crusaders lead out to seven points, then a penalty try in the 52nd minute via some solid scrummaging from their pack took the score out to 24-10. The Crusaders latched onto a loose pass from the Highlanders and Mo’unga kicked a high one for Sevu Reece in the 57th minute, taking the score out to 29-10. Mo’unga missed the conversion. Reece made a wonderful break that drew two defenders, making it easy for him to orchestrate a one-handed offload to Mitch Drummond to score another try for the Crusaders in the 69th minute. Mo’unga converted the try to make it 36-10. The Highlanders got one back in the 73rd minute through Josh Ioane, who scored his first career try for the Highlanders off a smart kick. Bryn Gatland converted to make the score 36-17. 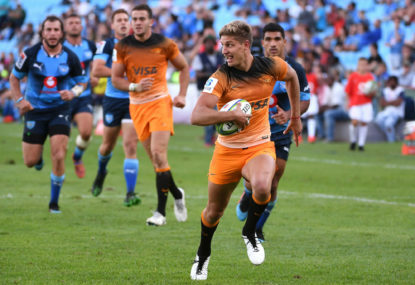 However, in the 76th minute, rising star Will Jordan scored by pulling a dummy that exposed a gap in the Highlanders defence, and through his explosive pace, he scored his eighth try for the season. Mitch Hunt converted the try to make it 43-17. Indiscipline by the Crusaders led to a yellow card for Ben Funnell in the 80th minute, but by then the game was well and truly over. The game ended with the ball being put into touch after a Crusaders turnover. Stars for the Crusaders were Whetu Douglas, Richie Mo’unga and Braydon Ennor. Douglas impressed once again with five passes, six runs for 28 metres, two offloads and 11 tackles. 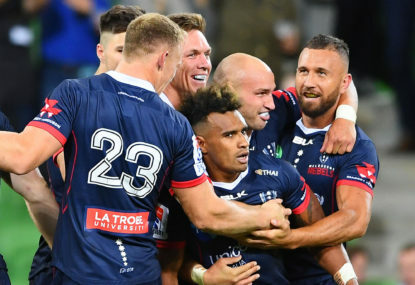 Mo’unga made 13 passes, ten runs for 35 metres, made two clean breaks, beat seven defenders, orchestrated three offloads, and missed just one kick. Ennor continued his solid year, scoring one try along with two passes, 11 runs for 46 metres, two offloads, and four tackles for the game. Matt Todd was solid in defence making 22 tackles and Sevu Reece was solid in attack, registering one try, two passes, eight runs for 99 metres, with three clean breaks beating seven defenders and initiating three offloads. The Crusaders made it 24 wins in a row at home and head into the bye with only one loss from nine games. They are on top and look like they are in another league at this point in time. Their next game is against the Lions at home and one would back them to continue their impressive winning streak and solidify themselves as the team to beat. The Highlanders are struggling this year and things do not look too good for the men from Dunedin. They head into next week’s crucial clash against the Blues with only two victories.